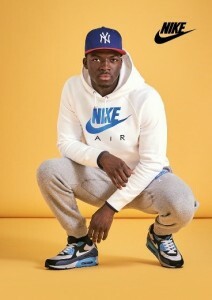 Embrace the change in seasons with a collection of vibrant street wear inspired styles that JD has to offer this Easter. Hook your look and brighten up your wardrobe with Springs hottest shades that feature across JD’s brand mix, including Nike, adidas, The North Face, Ellesse, Converse, EA7, Lacoste, McKenzie and Vans. 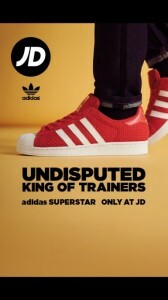 The Undisputed King of Trainers have got all your footwear needs covered, offering up some of the newest releases to the scene and a strong selection of exclusive styles that you will only find at JD! 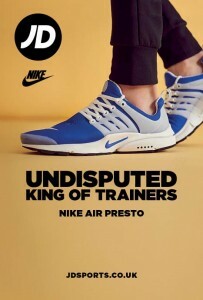 The men’s Nike Air Presto has got your Spring Covered; a brand new style to JD set to change our expectations of comfort, originally launched in 2000 as a running shoe, crafted with a dynamic stretch mesh upper, iconic Air-Sole heel, and flex groves to achieve a natural range of motion every step of the way. Now available in this stylish blue and white combo they can take you from track to streets – the Nike Air Presto are the key lifestyle kicks this Easter! 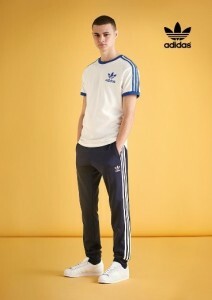 Adidas Originals are seriously upping their game this Spring; teaming up with JD to present two new exclusives – for both men and women. The iconic men’s Superstar gets a fiery kick with the red woven texture, complimented by the legendary leather triple stripe and rubber shell toe in crisp white. While the girls can pick up a fresh new take on the Stan Smith – the trainer of the moment gets a street-wear update with this cool combination of canvas and leather textures. 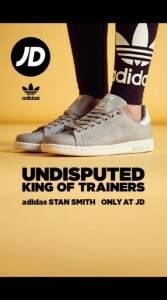 Available in either steel grey or a deep midnight navy – this addition to the Stan Smith family are sure to put a spring in your step. JD are also introducing their latest accessories this Easter – a versatile collection perfect for trend setting individuals who love to make a style statement. The new range of caps, backpacks, and festival bags, from the hottest brands – which feature eye-catching logos and fun colour-pops. With peak caps being the ultimate accessory for this spring, both New Era and Starter have a whole host of new styles dropping in JD this season. Be the first to get your hands on JD’s latest collections, from top brands which offer up a huge range of apparel, footwear and accessories in line with current trends. JD is the place to go for original effortless street style, able to allow any style seeker to mix and match their brands and customise to suit their individual style needs.